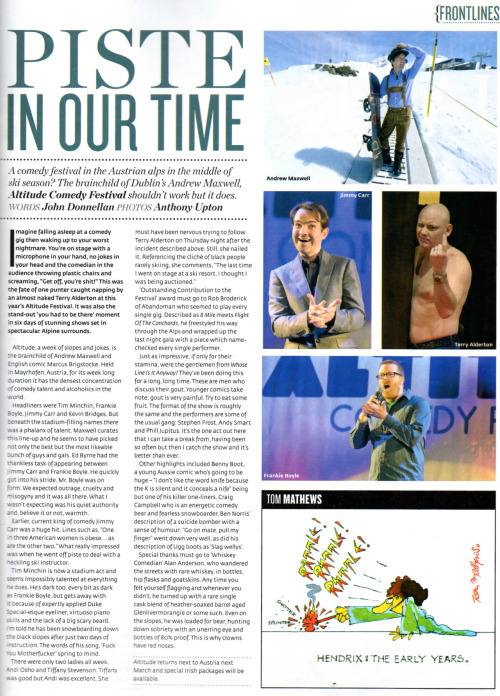 Alan Anderson Whisky Comedian in the Press & Reviews. “After over three years touring his show Whisky for Dafties (Dummies), Scottish comedian and whisk(e)y enthusiast Alan Anderson is back with the next lesson on the world of distilled malts and grains. The hour sees the comedian introduce the intimate assembly to four differing drams of whisk(e)y, noting the difference and encouraging audience members to share their opinions. 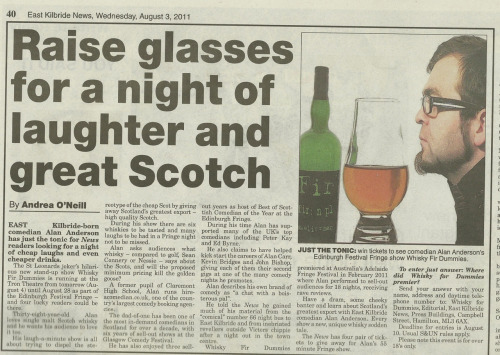 4**** for Whisky Fir Dummies from the Adelaide Advertiser. PROMISING a free whisky tasting with every show, it was no surprise to see the Austral’s Red Room at capacity for Alan Anderson’s weeknight show. And then, he sweetens the deal at the close of the show, doling out that much promised tasting to everyone. A definite must for whisky lovers and a good night out for anyone who’s not afraid of a tipple. 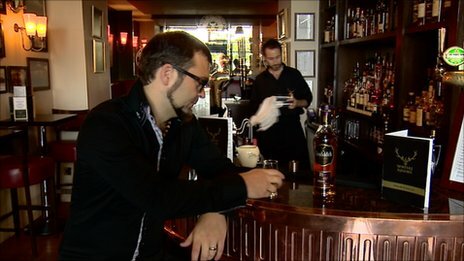 “Six malt whiskies to be tasted,” says the Fringe Programme. Unfortunately, what it doesn’t mention is that only one audience member gets to taste each one. A little bit sneaky, I thought, but everyone does get one free dram at the end, which I suppose is more than the majority of Fringe shows give you. It’s also a very funny and genuinely informative show. Anderson educates his audience on the wonders of Scotland’s finest export whilst simultaneously keeping the laughs coming with some non-PC, quintessentially Scottish humour, and by mercilessly ripping the proverbial out of those in the front row. It’s a riot, and while you may not get six whiskies, you will get a lot of laughs. Comedy meets strong drink in a Fringe World edutainment special. A Glaswegian comedian with a passion for whisky, Alan Anderson delivers his show with evangelical zeal, raising fervour among existing believers and gaining a few converts along the way. The pinkly-decorated tent venue of The Pink Flamingo at The Pleasure Garden is selling out with the promise of not only international comedy talent but also free whisky. Even with a late night start time, this is a winning combination. The bottles and glasses on the table at the rear of the stage indicate that the free booze may not be an empty promise, and the appearance of Anderson himself in a delicately printed shirt, short kilt, sporran, Birks and thick-framed glasses imply the man possesses a sense of humour. The presentation is a lecture delivered with bursts of stand-up and bouts of audience participation. A rapidly delivered spiel starts with the history of whisky, the etymology of the word itself, the cultural factors that lead to its invention, the general glorious inventiveness of the Scots, the dubious intelligence of the Irish and the general ignominy of the English. Various characters are established in the front row, to which he returns to raise laughter from time to time, and enthusiastic hecklers are drawn into discussions only to be more effectively quashed by a performer well-used to lubricated audience members. In the course of this, he also pours measures of Johnny Walker Red Label for much of the front row, finishing just before one of his night’s targets. The differences between types of whiskies are discussed, the manufacturing process and important tasting considerations. The tasting methodology involves further audience participation and banter, with responses elaborated on and humorously discussed. Once Anderson is satisfied that we have appreciated most of his exhortations on the finer points of whisky, he sets up a tasting feedback session featuring interpretative dance, before closing with a blind taste testing that demonstrates many of his earlier points. As we leave, we are offered samples of single malt to seal the deal. Anderson is a fine judge of comic timing, he has quick wits and a filthy imagination, all of which are wonderful. His passion for whisky is genuine, and he has refined his script to a tumbling patter. However, his determination to deliver so much information leads to a very dense show, not quite as much hilarity as the sneaking suspicion that there will be a test later on. This onslaught of information is not so much leavened as further compounded by his occasional rants about lazy review writing and distillery tours, all of which may work better over a more extended format than in this race-pace tent event. One for fans of whisky, banter and Scottish accents, Whisky for Dafties is a novel addition to this year’s Fringe World festival. It is hard to avoid alcohol in Edinburgh during the festival season. Many artists, especially comedians, have traditionally relied on booze to enhance their performances and some might hope their audiences will have done the same. Edinburgh’s major comedy awards and a number of venues are sponsored by drinks companies and almost every venue has a bar. Drink is everywhere and this year it seems to be the subject of a large number of Fringe shows as well. 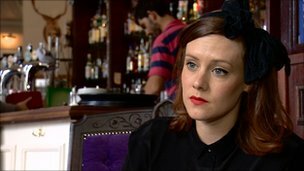 Jennifer Curran, head of policy at Alcohol Focus Scotland, said she would be concerned if Fringe shows took an irresponsible attitude to alcohol. Veteran comedian Arthur Smith, a Fringe regular for more than 30 years, came under criticism when he announced that all the guests at his chat show would be drunk. 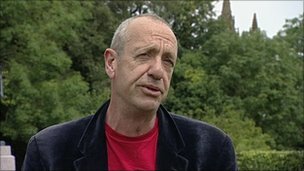 Arthur Smith said all his chat show guests would be drunkHowever, Smith is not a drinker. He said he used to be an “international class boozer” until 2001 when his pancreas went on strike and he nearly died. The Grumpy Old Men star said his show would explore the possibilities of intoxication from “the dull high ground of sobriety”. He said: “I am doing a chat show at which I am sober but all the guests are going to be drunk. Smith said: “Is it good to be drunk? Are you funnier? Are you more likely to let slip indiscretions? Or are you a thundering bore? “Alcohol is a big subject at the moment and my little contribution is to see what people are like when they are drunk. Smith also denied that earlier he had claimed audience members had to be drunk. “I don’t mind if the audience are drunk but I don’t want to encourage that because I will get myself in trouble with the Scottish licensing authorities,” he added. Increasingly intoxicatedWhile Smith’s social experiment may be a little hit and miss, performance artist Bryony Kimmings has taken a more scientific approach for her Fringe show, Seven Day Drunk. Each day, during a week-long experiment, Kimmings made herself increasingly intoxicated, under the supervision of a team of scientists, doctors and psychologists. Bryony Kimmings tested the link between alcohol of creativityShe was breathalysed at regular intervals to ensure a steady blood-alcohol level on different days, ranging from tipsy to paralytic, as she then attempted to make work in the studio. Kimmings wanted to test the traditional link between creative artists and alcohol. She said the experiment had completely changed the way she looked at drinking. “All of these scientific ways of looking at it have made me realise what it is doing to me is not a positive thing,” she said. Whisky connoisseur Alan Anderson wants to promote drinking but he urges people to develop an appreciation for high-quality drinks. He said his show – Whisky fir dummies – was a “celebration of Scotland’s greatest export”. ‘Greatest resource’Mr Anderson said: “By the end of the night we hope people will go away having had a hilarious time and have a better knowledge of whisky. “There are lots of great high-quality whiskies on the market but the Scots aren’t drinking them that much. “They are being exported around the world. Mr Anderson added: “I am not promoting drinking. I am promoting the appreciation of whisky. Not the Saturday night in the Grassmarket drinking culture. 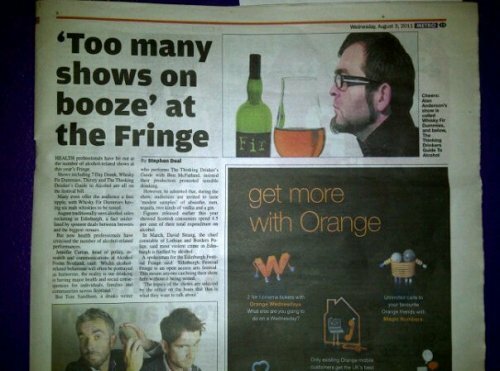 Another Fringe show – The Thinking Drinkers’ Guide to Alcohol – also wants to promote quality drinking. 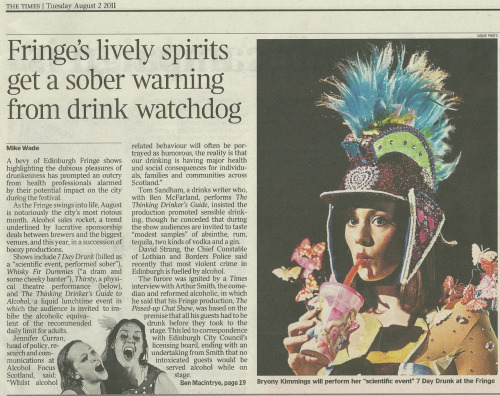 It will be up to audiences to decide if the secret of a good Fringe show lies at the bottom of a glass.